At Suncoast Gem Lab, conveniently located in the downtown Bradenton area of the Tampa Bay region of Florida, we are uniquely prepared to advise you about the care and maintenance of your jewelry. Tom Seguin began his career in the jewelry industry as a partner in a custom jewelry design studio in Sarasota Florida in 1984. The firm, Pure Excellence, had three full time jewelers that specialized in custom designed, one of a kind jewelry creations. In addition to the jewelry design and manufacture, Pure Excellence was also a jewelry trade shop specializing in jewelry repair and restoration and offering that service to other jewelry stores that did not have an in house jeweler. At Suncoast Gem Lab we provide all of the basic jewelry repairs including sizing rings, repairing worn or broken prongs in settings and repairing chains as well as the more involved repairs such as antique jewelry restoration and custom design and manufacture. 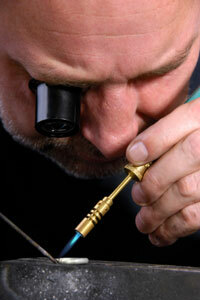 Remounting your gemstones into new jewelry is one area that is a specialty of ours. This requires exactly the specialized knowledge that we can offer you at Suncoast Gem Lab. We know what will work and what won’t. In the appraisal work that we do, we scrutinize jewelry for quality of design and execution and we see many examples of the common mistakes that are made in jewelry manufacture. You won’t see these mistakes at Suncoast Gem Lab. We also offer gemstone and diamond recutting and replacement and also provide jewelry replacement services for the insurance industry. These services complement all of the other services that we provide at Suncoast Gem Lab including diamond brokerage and sales, appraisals of all types of jewelry for the various market levels that are most appropriate for the assignment and sales of new jewelry items.